We are thrilled to announce our 3rd annual Drive For Independence Upshift Summer Bash. This year’s event will be held at the Antique Automobile Club Of America Musem, 161 Museum Drive, Hershey, PA 17033, on Saturday, July 30th,2016, It is a car show, food truck and vendor event. There will be plenty of beautiful cars, trucks and motorcycles, food vendors to tempt your taste buds, plenty of vendors to pique your interest, and T1 DJ Service, Travis Workinger to keep the party going. The Upshift Summer Bash is a fundraiser for Drive For Independence, a new organization in York PA to help adults with high level disabilities get wheelchair accessible vehicles to get to work. We are working towards the costs of becoming a 501(c)3 organization. Our sponsors and vendors help us to make the Upshift Summer Bash possible.Thank you to our Platinum Sponsors Keystone Mobility and AT&T Wireless- Harrisburg Mall. We would also like to thank our Gols and Silver sponsors as well. They are, Gold sponsors, Zunic Advisory Services, and Cold Cuts Merchandise, Silver sponsors, East Penn Manufacturing, Car Care Source, David Owens Bonsai, Passanante’s Home Food Service, and Jim and Polly Shumate in Memory of Tyler Shumate. Our Platinum, Gold, and Silver Sponsors made 50 t-shirts possible for the first 50 registered vehicles! Our Bronze Sponsors are MTH Metal Art, Junk Ta Funk, The Barbecue Machine LLC, and T &E Lemonade. Thank you all! Be sure to stop by and say hello to them! Hungry? We have a great selection of 6 food vendors from barbecue to ice cream to fill you up. We also have vendors for all your shopping needs! Home crafters and favorite direct sales companies will be on hand to satisfy your shopping fun. We will also have a ticket auction and silent auction. Each car show participant will receive 1 ticket for the ticket auction upon registering. Spectators can also receive 1 ticket by registering for the silent auction. We will have our “Fill the Tank” where every donation will earn you tickets: 1 ticket for $1.00, 6 tickets for $5.00, 13 for $10.00, and an arm span for $20. We have some great silent auction and ticket auction donations coming in from the the Vineyard and Brewery at Hershey, The Pride of the Susquehanna, Goin’ Bananas, Advance Auto, Koup’s Cycle Shop, Ski Roundtop, Adventure Sports in Hershey, Turkey Hill Experience, York Revolution, and much more! We would love to fill our show field with 150+ Cars, trucks and motorcycles. Pre-register your vehicle by July 23rd by visiting: https://squareup.com/store/christopher-sauerbaum/item/upshift-summer-bash-registration. You can also pre-register by going to the link below and printing out the mail-in registration. Pre-registration $20.00 and includes 1 admission to the museum ($8.00 of the $20.00 goes to the museum for that admission) while the day of the show registration is $25.00. The FIrst 50 registered Vehicles will receive a free T-Shirt! We will have Best of Show, Peoples’ Choice, Kids’ Choice and 17 class trophies including many car makes, trucks and motorcycles. See this link for more details: https://driveforindependence.wordpress.com/2016/02/01/2016-upshift-summer-bash-flyer/. Trophies are designed by Chris Sauerbaum for the judged show field. There will also be a People’s Choice trophy voted on by fellow participants and the general public. The first 100 registered cars will receive a dash plaque and we will have 50 shirts to give away. Chris is definitely showcasing his graphic design abilities with this show. We will continue to grow the Upshift Summer bash bigger as Drive For Independence grows. We are taking everything we learned from fund raising for Christopher Sauerbaum’s Wheelchair accessible truck and helping others in a similar situation achieve accessible transportation for work. For more information please see https://driveforindependence.wordpress.com/2016/01/24/were-on-the-move-3rd-annual-upshift-summer-bash/ or our Drive for Independence Facebook page http://www.facebook.com/driveforindependence. To make a tax-deductible donation please see http://www.philanthropicendeavors.org/ and mark Drive for Independence in the Paypal notes section. We can be reached at driveforindependence@gmail.com or 717-991-5921. On Thursday April 7th 5pm-9pm we will have our 2nd Dine For Drive For Independence at Isaac’s in East York. Everyone has to eat so this is a super simple way to support Drive For Independence. Print out the flyer using the PDF link below (or stop by to see us on Saturday April 2nd to pick one up), fill it out and give it to your waiter/waitress. It can even be used on take out orders! Once we have $100 in sales that evening Isaac’s will donate 25% of the total sales for that evening to us Can’t join us that evening? Get a gift card for later and 15% of the value of the gift card will go towards the fundraising event. We are delighted to announce our first annual Pamper Yourself-Mom’s Day Out (and Chicken Barbecue) to benefit Drive For Independence. Our mission with Drive For Independence is to help those with high level disabilities obtain wheelchair accessible vehicles needed to get to work and achieve their dreams for independence. We started the organization while fund raising for Christopher Sauerbaum’s wheelchair accessible vehicle. Chris, along with his wife and many other dedicated individuals have raised the funds for a down payment on his vehicle which was recently converted for his specific needs. After meeting his goal we decided to immediately work on paying it forward and helping others meet this same goal of being able to drive themselves to work and lead an overall more independent life. The event will run from 10:00am-4:00pm on Saturday, April 23rd, 2016 and will be held at the Hellam Fire Hall: 163 East Market St., York, PA 17406. Funds raised at the event will go towards start-up and program expenses for Drive For Independence.Various vendors are signed up to attend the event, ranging from one-of-a-kind handmade goods to favorites such as Thirty-one gifts, Pampered Chef, and Mary Kay, as well as a make and take gift kids can make for mom. We will also have a ticket auction and each person who comes in the door will receive 1 ticket. Additional tickets may be purchased. Food will be provided by The Barbecue Machine LLC and will feature Chicken barbecue and an assortment of desserts. Tickets can be purchased for $10.00 each. Each meal will include a 1/2 Chicken, baked potato, baked beans, macaroni salad, and a roll w/ butter. Drive For Independence will receive $1.00 from each ticket sold. To guarantee your meal ticket we need the money no later than April 8th. They can be purchased by check through mail, cash in person, or via Square online payment. Tickets ordered through Square will be subject to a $0.50 per ticket convenience fee. Please contact us if you would like to meet for cash payment. Checks can be made out to Heather Sloat with a memo of MDO-Chicken Barbecue- # of tickets. Mail to: Drive for Independence, PO Box 20752 , York PA 17402. Please include an address to send your tickets to you. If you have any questions you may call 717-991-5921 or email us at driveforindependence@gmail.com. Please join us and celebrate Mom while helping out Drive For Independence. Our goal is to keep this going yearly and to be able to help other individuals with limited mobility to reach their dreams of working and driving as well! The Barbecue Machine LLC– will be doing Chicken Barbecue dinners $10.00 each. The Barbecue Machine will also be providing coffee and desserts. Do You Bake? With Lexi M.
The 3rd Annual Upshift Summer Bash is moving to a new location! We’re excited to announce we will be at the Antique Automobile Club of America Museum in Hershey, Pennsylvania. Join us on Saturday July 30th 10am-4pm for the 3rd Annual Upshift Summer Bash at the AACA Museum 161 Museum Dr, Hershey, Pennsylvania 17033. There will be plenty of cars, trucks, and motorcycles to pique your interest an much more! Enjoy music, a variety of food trucks, and a great group of vendors ranging from car care to crafters and artisans. Bring the entire family! Your car registration donation includes 1 admission to the museum. Pre-register at the discounted rate of $20.00 (use the Square Up link below or send in your registration using one of our pre-registration forms in the link below). The day of the show is $25.00. Additional visitor tickets to the museum are regular museum admission price (See this link to purchase tickets to the museum only: http://www.aacamuseum.org/visit/hours-rates/ ). Unless you want to visit the museum, spectators are free. We will be raising funds for Drive For Independence. Our goal is to help adults with physical disabilities get the transportation they need to get to work. Please join us to help others reach their goals in life! silver $100.00 (1 trophy/class plus what is listed in the letter), Gold $250 (3 trophies/class plus what is listed in letter), Platinum (only 2 spaces available large trophy best of show or People’s Choice). Classes are listed below in the sponsorship letter. Please see links below to register. We are currently looking for sponsors, vendors, and food trucks. We currently have a DJ- T1 DJ Services by Travis Workinger. Interested sponsors please see the sponsorship letter below. If you would like to register as a sponsor, vendor, or food truck please contact us for an application: Driveforindependence@gmail.com. Drive for Independence is an organization dedicated to helping individuals with high level disabilities obtain wheelchair accessible vehicles needed to drive themselves to work and achieve their dreams of independence. We have already helped one individual achieve his dream. Christopher Sauerbaum along with his wife and many other dedicated individuals raised the funds needed for a down payment on his Truck that was recently converted for his specific needs. He is now able to drive himself to work and run everyday errands without relying on a bus or someone else to drive. After meeting his goal they decided to immediately work on paying it forward and help others meet the same goal of being able to drive themselves to work and lead an overall more independent life. 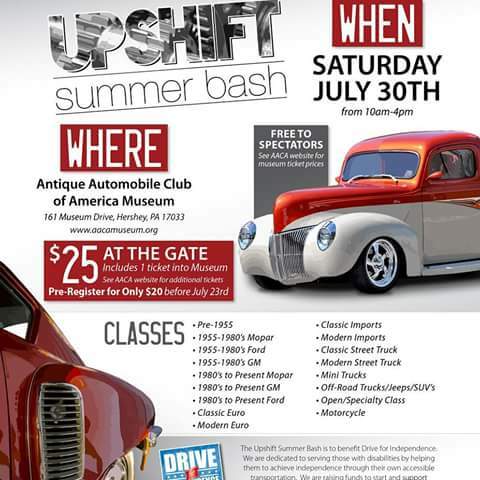 Our annual Upshift Summer Bash car show is one of our largest fundraisers. Upshift Summer Bash 2016 will be held on Saturday, July 30th, 2016 at the AACA Museum in Hershey PA and will showcase a variety of vehicles including cars, trucks and motorcycles with everything from classics to tuners. We are seeking the support of business and private sponsors. There are several possible ways to support this event including Sponsorship, donation to the silent auction and raffle, and door prizes. We are also accepting donations to the silent auction (donations worth over $50.00) / ticket auction ( items valued under $50.00) to be held during the event. The items will be on display throughout the event for the public to bid on. Each item will include a card with information about the item including the value and who it was donated by. Corporate sponsorship is not necessary to make a donation to the silent auction. All donations are greatly appreciated. Platinum, Gold and Silver Sponsorship Levels are limited and will go on a first come basis. We encourage all interested sponsors to return the sponsorship form as soon as possible to ensure inclusion of your logo on promotional materials. Logo must be in .JPEG, .PSD, or .EPS format and at least 150dpi (300dpi preferred). Please e-mail your artwork to: driveforindependence@gmail.com. We thank you for your consideration in supporting our Upshift Summer Bash 2016 and ultimately our mission with Drive for Independence in helping individuals with high level disabilities reach their goal of being able to drive themselves to work and achieve a new level of independence. We look forward to seeing you join us at the Upshift Summer Bash 2016 being held at the AACA Museum in Hershey, located at 131 Museum Dr, Hershey, PA 17033 . Join us for Pamper Yourself-Mom’s Day Out! On Saturday April 23,2016 we will be holding our first annual “Pamper Yourself- Mom’s Day Out. It will be held at Hellam Fire Hall, 163 E Market St, York, Pennsylvania 17406 from 10am-4pm. We all know how busy moms are so we want to give mom’s the chance to come take of themselves a little. We plan to have chair massages, mini- manicures and Jamicures, a little spa make and take made with essential oils to relax at home with and a few other treats. We will have various hand made crafters as well as your favorite home based businesses for some shopping fun. 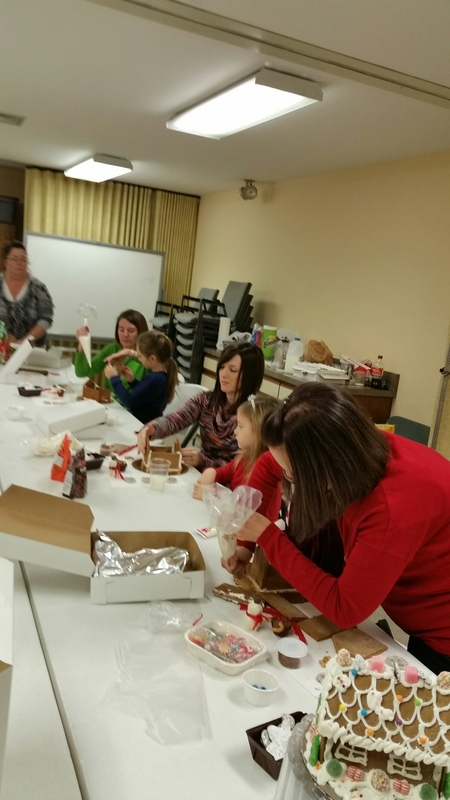 If you need to bring the kids we’ll have a craft area to make a surprise for mom! We also plan to have a ticket auction so come out and get some great gifts for mom. 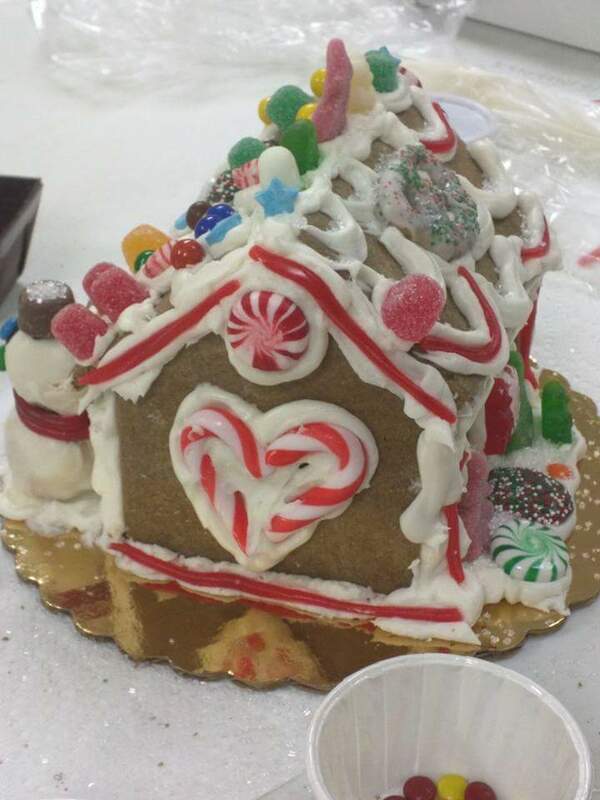 We are currently seeking craft vendors, limited home based business (unless you carry a unique line) and food vendors. We have room for 20-22 vendors on the floor as well as 2 food vendors in the kitchen area. If you would like a vendor application please contact us at driveforindependence@gmail.com. 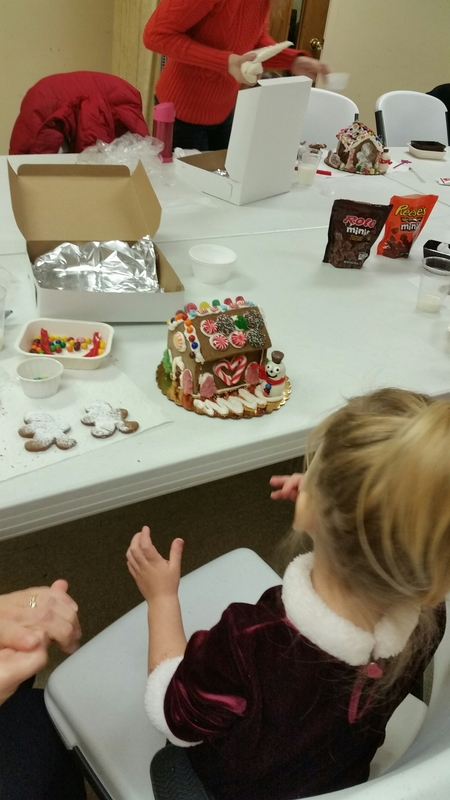 We had a wonderful morning at our 2nd Gingerbread house class. 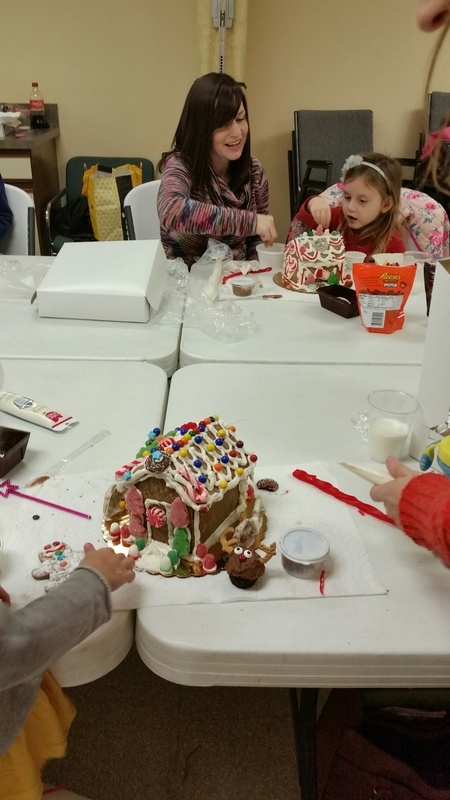 Thank you again to the families who joined us. It was so much fun sharing this class. We can’t wait to do it again next year! We will be looking at other classes to share as it is sharing skills we have with others while helping us to build our programs and organization. It is a win win for everyone! Thank you again to all who made the classes a success. Thank you to Wingate at Wyndham and Valley View for allowing us to use their facilities for our classes as well! Learning to build snowmen and reindeer as a warm-up. 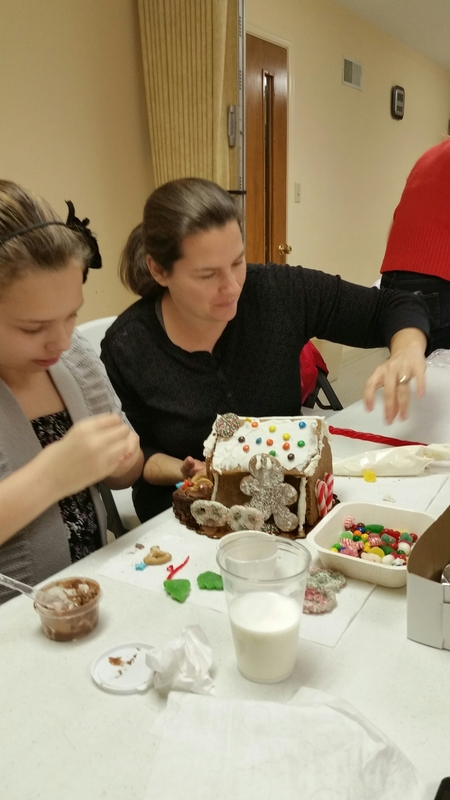 Tammy teaching how to build the base house.